Walter W. Waters, “Walter W. Waters,” Histories of the National Mall, accessed April 23, 2019, http://mallhistory.org/items/show/120. In May 1932, Walter W. Waters, a World War I veteran, led a group of his fellow veterans to Washington, DC, to demand immediate payment of bonuses which were not due to be paid to the soldiers until 1945. This group was dubbed the Bonus Expeditionary Forces, or the Bonus Army. During their time in Washington, as they camped on the Mall and on the banks of the Anacostia River, Waters acted as their leader and spokesman. 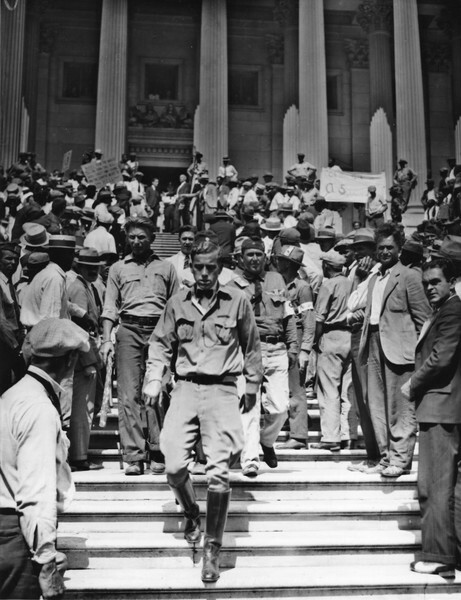 The Bonus Army was evicted from the city in July. General Douglas MacArthur Foundation, Norfolk, Virginia. Walter W. Waters was born in Oregon in 1898. In 1916, he joined the Idaho National Guard and was deployed to Mexico to hunt for the revolutionary Pancho Villa. At the end of his enlistment in 1917, he joined the Oregon National Guard and deployed to France to fight in World War I. He received an honorable discharge, returning home in June 1919. Waters was part of the last group of veterans to return from Europe following the war and, like many of his fellow soldiers, he had a hard time readjusting to civilian life. During the 1920s, he moved around the north western United States working at various jobs. As he traveled, he met other veterans who were also having trouble finding or keeping work. In 1932, Waters organized his fellow unemployed veterans in a march from Washington State to Washington, DC. The group, called the Bonus Expeditionary Force, or the Bonus Army, demanded that Congress authorize immediate payment of bonuses due to veterans which were not scheduled to be paid until 1945. Waters and the veterans set up camps along the Anacostia and near the Capitol while the Senate debated a bill which would give them their bonuses. The bill was defeated and the Bonus Army was evicted from the city. Waters wrote a book about his experience with the Bonus Army, B.E.F. : The Whole Story of the Bonus Army, published in 1933. He enlisted in the Navy and fought in World War II. He died in Washington State in 1959.